Perhaps the masks were made with the intent to intimidate, the way Samurai masks were? Using exaggerated features? alternately, perhaps since Tolkien usually equated "industrial" with "ugly" (look a the corruption of the shire or the industry at Orthanc), perhaps the Belegost Dwarves just had a practical aesthetic and the resulting non-natural look was considered 'ugly' by the much more nature focused elves (who are the ones that wrote the silmarillion). so the dragon proof dwarf masks might just resemble welding masks. JRRT does say somewhere they were war versions of the masks the Dwarves wore in their forges. So that welding mask is pretty close to it I think. Last of all the eastern force to stand firm were the Dwarves of Belegost..... it was their custom moreover to wear great masks in battle hideous to look upon; and those stood them in good stead against the dragons. Hmm. 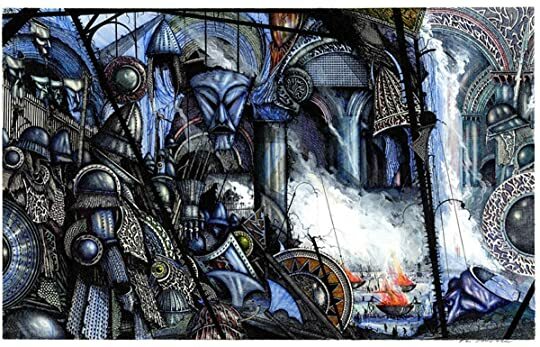 Maybe Ian Miller's classic illustration is too lame (see upper left corner). How about this and this? But are they 'great' and 'hideous' enough? What about these, these or this, or this? Are they terror enough, if they would be made of non-flammable materials? A mere welding mask is way too lame to work against orcs! perhaps hybridize welding masks with Jousting helmets (which is what we tend to think of when thinking of plate armor, due to popular media misunderstandings)? toss in some cosmetic stuff for dwarf style and you'd be set. I agree with Nick, the Sutton Hoo helmet would be a good place to start fora dwarf helmet - only the face would need to be made more hideous. In what way this would be done I am not sure. Samurai helmets often have demonic looking masks. I don't see this being a visor that can be raised - the First Age in particular should have a dark ages/late antiquity feel. actually in Tolkein's works the First Age was presented as a golden age, of which the 2nd was a pale shadow.. and the 3rd Age was a pale shadow of the 2nd age. the 3rd Age was clearly presented as an early middle ages ("dark ages") aesthetic in general, though the Shire is clearly a slice of 17th century rural england stuck into an otherwise medieval age. the 1st and 2nd age involving more elaborate styles of the sort we saw in later periods IRL seems fitting to me, given that in the 1st age we also had things like the 'forged monsters of iron and fire' used to breach the wall of Gondolin (the description of which sounds very much like Tanks), or the flying ship Vingilótë captained by Eärendil. the First age was an Age of wonders unlike any that followed, so it seems weird to limit it to one tiny slice of real history, particularly one that was already well represented in the 3rd Age. Interesting idea! I'd suggest looking at the various 'wilder man' costumes still in use around Europe, there might be some good inspiration there. The First Age was a golden age because it was dominated by the elves and they were, at that time, greater in body and spirit. The Second and Third Ages were progressively more dominated by men and elves were beginning to "fade". It is also said that men were greatest in body in that age, other than the heyday of the Numenoreans (in other words, common men were greater than in later times but were, of course, eclipsed by the Numenoreans). The glory of the elves was in their "artistry". Yes, they had technology, but there was something of art and what men might term magic in what they made. In terms of true technology I don't believe they were advanced. The iron machines involved in the destruction of Gondolin are constructs of Morgoth and we should not conflate this with elven technology. The mention of these machines is from earlier writing and is not part of the published Silmarillion. It depends what you feel is canon for the First Age. I personally prefer the Silmarillion but there is nothing to stop you preferring the earlier versions of the stories. I would wonder whether Numenor would represent the true technological high point - great ships, mighty armaments, bows or steel, fortresses such as Orthanc. This is a round-about way of saying I still think I would go with dark age style helmets. If we had more modern visored helmets then we should also be seeing plate rather than mail. the 1st age was a golden age for everyone, not just the elves. we just know more about their part because the Silmarillion is an elvish chronicle, and they didn't talk much about what men and dwarves were up to. and even in the 3rd age you saw a lot more than just the "dark ages" aesthetics. Imrahil and the knights of Dol Amroth had plate armor, and they were called a glimpse into the rise of Gondor in the 2nd age. so the idea that dwarves can't have anything other than dark ages aesthetics (aka "variations of chainshirts and spangelhelm everywhere you go" with the occasional scale and brigandine instead of chainmail) in the 3rd age much less the 1st seems a little disingenuous. it gets even more so when you consider that while Oathmark is definitely Tolkein inspired, it is not middle earth, and as long as the result looks good alongside the existing Oathmark Dwarves, they can use whatever the heck they like for armor style inspiration and no one can say they are 'inaccurate', since it is a fantasy setting. That's true Mithril, but I must point out the masked Dwarves here are a 'Nick thing' and in no way anything to do with official Oathmark stuff. It's me goofing around with plastic bits, and musing on Tolkien's words. Might just have to agree to disagree on Tolkien armour and plate but fully agree about this being fantasy and Nick, I am sure, will do whatever he feels is right for his business. Personally, I will hope for mail and Dark age vibe but will happily await what ever comes out from Oathmark. Imrahil showed that Eowyn was alive by displaying the effect of her breath on his "highly polished vambrace." a vambrace is the arm plates (lower arm) in a suit of platemail, and for it to be highly polished it would have to be solid metal. since you would not be wearing vambraces without at minimum a cuirass and a set of greaves, this would indicate they were wearing either"half-plate" (the parts described) or full on gothic (aka 'full') plate armor. both of which are a late middle ages and renaissance armor technologies. combine that with things like the Shire having mantlepiece clocks (a 18th century technology), waistcoats (18th century clothing), etc, and it is clear that Tolkein didn't see himself limited to a specific real world period. it gets especially noticeable when you consider that Gondor largely seems to be 13th century (with some exceptions, like the Knights of Dol Amroth), but their biggest ally is a nation of horse riding 9th century Anglo-Saxon expies. which sparked a discussion of what such masks might be like, using both real world and tolkien related inspirations. since the existing box set covers the lighter units of a dwarf army (bowmen, basic spearmen and basic warriors), a 2nd set incorporating masks suggests a box of more heavily armored infantry.